Hitachi or Johnson-Controls Hitachi is a reputed brand in air conditioning. Being a Japanese brand, Hitachi produces good quality products with improved technology and advanced features in its air conditioners. Hitachi is amongst Fortune 500 company. If LG and Voltas are fighting for the top position in air conditioning market in India, Japanese behemoths Hitachi and Daikin too are closely following them. Versatility, innovation, and push for energy efficiency in large appliances are observed to the key theme in the Hitachi AC. They offer a complete catalog of ACs ranging from residential to commercial, from split to windows and from inverter-based to fixed speed ones. Also, they have a good network of R&D labs, manufacturing units, retail outlets and service stations. Presently they have over 600 service centers in India, number good enough to instill faith in Hitachi. Hitachi has one of the highly qualified teams of R&D engineers and professionals. They are always on a quest to improve and innovate air conditioning. iSee and iSense technologies are the results of that. New models in the Kashikoi series are equipped with a patented iSee technology. These models come with an intelligent image sensor technology ensure that the users inside the room get an equal attention for an equal cooling comfort while minimizing the wastage of cooling. The image sensor detects number of people in the room, their location, their activity etc and then cools accordingly to ensure maximum cooling comfort. It also recognizes the shape and size of the room and then regulates its swing angle with a special smart swing feature in a bid to optimize cooling. The main philosophy of iSee technology is to make sure that the airflow is directed only towards people present in the room instead of bunting the airflow on the wall. Another important feature is it also recognizes human absence in the room for a specified time and the switches off the AC automatically to avoid wastage of cooling. How many times has it happened that you wake up in the middle of the night feeling too cold? Well, that’s because as the night progresses temperature dips a little; but the ordinary AC working with a fixed setting fails to consider that. This results in feeling colder in the middle of the night. Hitachi engineers have seemed to correct this problem using iSense technology which now features in the newer models. Hitachi ACs with the iSense technology comes with an infrared sensor which detects human movement during the sleep. In case of no active movement, AC increases the thermostat temperature by one degree centigrade per hour for next two hours. This way comfortable and uninterrupted sleep is ensured. Sensors are so smart that when you wake up in the morning, it detects your movement and restores back the original preset temperature! There are times when you misplace the remote of an AC. And if this happens when you want to switch on the AC during the sweltering summers, nothing worse. 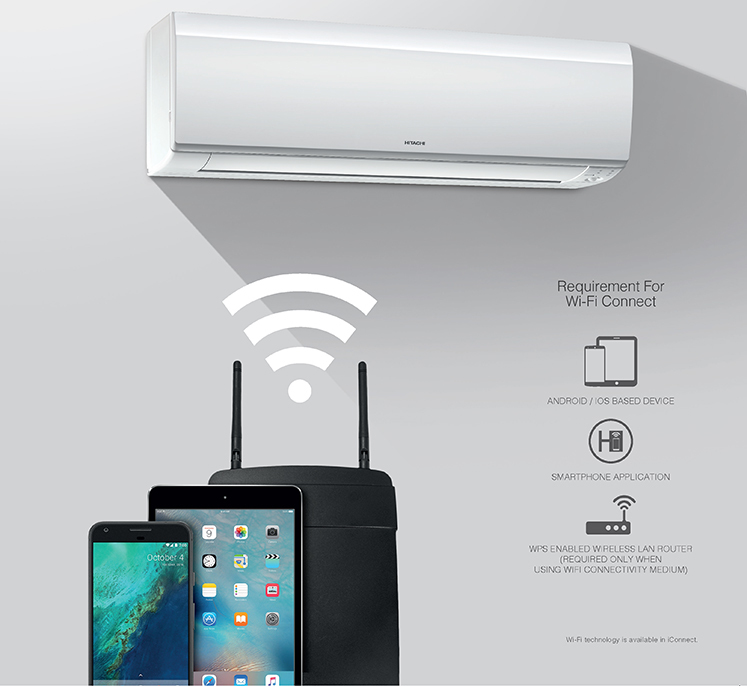 The iConnect series from Hitachi comes with a WiFi-Connect feature which helps to manage the AC using the smartphone. The user simply needs to download the dedicated Hitachi app and pair it with a router. Once the connection is established, the user can control up to 4 ACs from any part of the room. The best part is, even if router or WiFi network is not present, one can still connect the smartphone (even the tablet) with the AC using WiFi Direct feature. This would be a boon for the people who have a habit of misplacing their AC remote somewhere and then forgetting where they last kept. Usually, ACs come with 2-way (up and down) swing blade to disseminate cool air inside the room. But modern Hitachi split AC comes with the 4-way swing function (up-down + right-left) which blows the cool air in multiple directions to ensure thorough cooling inside the room. This 4-way air distribution system cools a bigger area in a short span of time simply by adjusting horizontal and vertical louver. Whenever you hear a word AC, what comes to the mind is an appliance which blows chilled air bringing down the temperature of the enclosed space to comfortably cool levels. But the pioneers of air conditioning systems invented it with an idea of “conditioning” or setting it to a desired/specific temperature. So theoretically ACs should condition the temperature in the winter too as per the user’s need i.e it should heat the room during the frosty winters. Well, the modern Hitachi ACs including windows (Kaze series) can implement that theory (of heating during winters) too. They come with a built-in heater functionality in the form of heat mode option, which upon enabling reverses the air conditioning process. This results in circulation of hot air inside the room. Hitachi Hot & Cold ACs can operate in the wide range temperature—from –15oC to 52oC. Summer season makes the AC overwork and with the monsoon to follow, ordinary ACs could fail to control the humidity or even result in water leakage. During the rainy season, conventional air conditioners not only consume more energy but also make the room uncomfortably cold. This may lead to health ailment like sneezing, common cold or even headache. Hitachi being an established brand have noted this problem specific to the subcontinent’s climate. As a solution to it, new models of Hitachi ACs come with Auto Humid Control technology. Temperature and humidity data of over 100 cities is fed inside the processor of ACs. Based on the data it adjusts the air conditioning and when it detects the high humidity the refrigerant cycle is expedited to extract humidity out of the room. Many models additionally come with the Dry mode which allows the user to manually dehumidify the room. There are times when you spend an arduous day out in the parching sun and back home tired with sweat flowing through your brows. When back home, all you want is a sweetly cooled ambience. But then the old AC takes up a while to deliver comfort cooling, leaving you enervated. Thankfully, Hitachi ACs, armed with various fast-cooling technology to make sure AC works to its full potential to quickly cool the room. Modern Hitachi split ACs come with a Powerful mode which makes the fan run at the maximum possible speed in a bid to quickly cool the enclosed room. Similarly, there is a Supercool mode in windows AC which serves this purpose. Filters are an important component of ACs, and if ignored it could drastically reduce the cooling capacity. In fact, according to the studies an AC which is run daily for 6 months without cleaning and maintenance, it’s cooling capacity can diminish by up to 50%. In the fast-paced world, we often forget to clean and maintain our AC at regular intervals. Now, what if we tell you there are ACs which can even clean itself without human intervention? Sounds too good to be true, but its achieved in the modern premium models of Hitachi which comes with an iClean technology. Such models come with an innovative brush that moves on the stainless steel plated filter from one side to the other by sweeping the dust along the wing. There is a dedicated dust box which collects the dust particles swept by the brush. This auto cleaning barely takes 5-7 minutes to complete. Once the cleaning is done the brush moves back to its initial position. As we mentioned earlier, the filter is stainless steel coated; this helps in improving the indoor air quality by inhibiting the growth of bacteria owing to its anti-bacterial properties. Also, models from Sumo series comes with Nano Titanium filter that deodorizes the air to filter the air of any foul odors. These filters are made of high-quality material and are resistive to corrosion. Though iClean does its job tactfully, few Hitachi models additionally come with Filter Clean indicator which notifies the user in case there is a manual need to clean filters. This manual cleaning is pretty straightforward and can be done even without using water. Copper tube condenser, evaporator & interconnecting pipes in most of the new models from Hitachi are made 100% of copper. . One of the important advantages of copper condenser over the conventional aluminum one is that heat transfer in copper is better. The copper condenser is more durable and much easier to clean and maintain compared to the aluminum condenser. Also, models like Toushi comes with inner grooved copper which helps in quick and optimum refrigeration flow. Grooved copper means increased surface area provides which in turns provides better heat exchange and improves overall efficiency. Another good thing about Hitachi ACs is that they come with an anti-corrosion fin on the outdoor heat exchanger. So, people living in the region with high humidity will find this feature very useful to safeguard their AC from corrosive elements and to extend the AC’s life in general. A refrigerant is a fluid that soaks the heat from the room and transfers it to the outer atmosphere. A refrigerant undergoes phase changes from a liquid to gas (on absorbing heat) and back to liquid (when a compressor compresses it). Most of the inverter ACs from Hitachi comes with R-410 refrigerant. R-410 is a hydro-fluorocarbon (HFC) which does not contribute to ozone depletion. R-410A can absorb and release more heat than conventional refrigerant. This means your air conditioning compressor can run cooler, reducing the risk of compressor burnout due to prolonged usage. R-410A has a wider operating pressure range as opposed to archaic refrigerant like R-22, so the compressors from newer Hitachi models are built to withstand greater stresses, minimizing the chance of compressor leakage or breakdown. All ACs need oil to keep the compressor lubricated. ACs using ozone-depleting R-22 refrigerant usually use mineral oil. But R-410A systems use synthetic oil. The synthetic oil is generally more soluble in R-410A than mineral oil is with R-22. This means the R-410A system operates more efficiently which again helps in reducing the wear and tear on the compressor. Power cuts and load shedding is commonplace in India, especially in distant towns and villages. Being a heavy electrical appliance, AC is generally most susceptible to the erratic blackouts. Power cuts can damage the AC due to voltage fluctuations. Hitachi’s modern ACs are well-equipped to handle this crisis. Premium Kashikoi series comes with the stabilizer-free operation. What this means is that AC can work steadily and reliably without getting damaged due to excessive flow of electricity in case of voltage fluctuations. Also, if voltage fluctuation exceeds the preset permissible limits (130V-300V), the power supply is automatically switched off, so it does not cause any serious harm to the AC. For decades, ACs had single-speed compressors that were either on or off. A compressor is an engine that powers the air-conditioning cycle, moving refrigerant through the arrangement of condenser, compressor, and evaporator. With a single-speed compressor, when the temperature inside the room reaches above a certain temperature, the compressor suddenly switches on—a familiar noise for those who own an AC from the 20th century. But the concept of the inverter has completely changed the dynamics of AC (and refrigeration) industry. Inverter compressor is arguably the biggest innovation in ACs. Thankfully, new line up of the Hitachi ACs come with a expandable tropical inverter technology specially designed for tropical Indian climate. In fact, inverter ACs makes more than half of the AC sales for Hitachi—a share which is pretty high. This goes on to suggest that Hitachi inverter ACs are the more preferred choice for the consumers. So, what is an inverter technology? Well, to be really simple, inverter technology is analogous to the car accelerator. When compressor needs more power, it gives it more power. When it needs less power, it gives less power. With this technology, the compressor is always on but draws less power or more power depending on the temperature of the incoming air and the level set in the thermostat. The speed and power of the compressor are adjusted appropriately. Expandable tropical inverter ACs uses Seamless Cascade Vector DC Inverter System which gives better performance than any other non-tropical inverter AC. To improve coefficient of performance in full load as well as part load conditions, Hitachi has also introduced a new concept called Dual Flow Expansion Technology (DFET). All these additions in the Hitachi’s tropical inverter compressor optimizes peak performance to give perfect cooling even in the extreme temperatures of 52oC. . Versatility is the biggest plus for Hitachi. Hitachi offers all types of air conditioners to fulfill varying needs of varied customers. For environment and energy conscious people it offers an inverter AC with eco-friendly refrigerant, while for those with thrifty budget affordable windows AC is the savage. And if you between the two, you can opt for a fixed speed split AC. For businesses, Hitachi offers cassette and ductable air conditioners. So, Hitachi has something for everyone. Durability is another plus point, being a Japanese brand Hitachi is extremely conscious of the quality. In fact, their ACs goes up to 43 different tests to make sure ACs not only deliver comfort cooling but also endure the vagaries of external/working conditions. To impart better customer service Hitachi has set up two Engineering Excellence Center and (plans two more in the near future) to enhance the technical skills of staff and technicians. This clearly signifies Hitachi’s seriousness to cater the needs of the customers. Hitachi ACs are one of the best when it comes to quick cooling as their ACs are designed to start at high RPMs in order to bring down the room temperature to the desired level faster. Stabilizer-free operating range of 130V-300V is one of the best in the AC industry. Though premium Hitachi models boast of automatic cleaning through iClean Technology, the absence of PM 1/PM 2.5 filter is something disappointed us. This is where brands like LG and Daikin have an upper hand over Hitachi with more sophisticated air filtration system. We also miss the anti-mosquito technology, something which newer models of LG come with. Hitachi is definitely a reliable brand and one of only a few companies which offer such a long list of features and technologies in its appliances. Hitachi is a part of reputed Hitachi Group which makes into the elite Fortune 500 list. Modern Hitachi ACs are fed with the temperature and humidity data of over 100 cities so that they can adjust its operation time to time to deliver optimum cooling. iSee and iSmart technologies further assist the AC to impart efficient cooling through its 4-way swing blade. Usage of high-quality copper in the construction is again something which improves the durability benchmark. The tropical inverter is the cherry on the cake. Specially designed considering tropical Indian climate it can operate even in the extreme temperatures of 52oC during the peak summers to ensure efficient uninterrupted cooling.